New York Times staff reporter Barron follows a Steinway Model D concert grand piano from warehouse to concert hall. The main character in this story, which began as a series of Times articles, is K0862. (Steinway pianos are known by their numbers.) Born as a few strips of lumber, glued together and bent into shape, K0862 was raised in the Steinway factory and warehouse in Queens, where it was given body and voice. Eventually, it left home for a professional life. Barron documents each step of the process and profiles the workers who complete each of the necessary tasks. 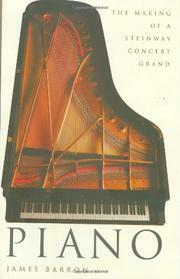 Himself an amateur pianist, he combines a journalist’s eye for exactitude with a musician’s love of the instrument. He follows K0862 through the 11-month process, from the bending of the rim through the filing and sanding of each individual key and hammer to the voicing and multiple tunings in soundproof booths. A postlude follows K0862 once it leaves Steinway. The author supplements this individual odyssey with a history of Steinway & Sons. Founded in 1853, the firm faced some daunting challenges in the 20th century. First radio, then television promised entertainment at the twist of a knob (no lessons necessary), and in less than three weeks in 1953, more television sets were made than the total number of pianos built during Steinway’s first hundred years. Yet despite these changes in technology and manufacturing, the company has maintained itself in the art and business of piano-making. The author’s attention to minutiae makes for a few tedious sections, but he successfully conveys the pride each Steinway employee takes in this storied musical instrument. A treat not just for music-lovers, but for woodworkers, craftsmen and anyone who has ever mourned the passing of grand tradition.